August knows how to rock the box office because our movie line up for this month is looking LIT. Based on the novel by Kevin Kwan, CRAZY RICH ASIANS follow the life of Rachel Chu (played by Constance Wu) as she goes on a vacation to her boyfriend’s family country in Singapore and learns that he comes from an extensive background of wealth and power. But all eyes are on her as the family matriarch finds Rachel unsuitable for her son. If you loved Shark Week, you’re for a real bite with Jason Statham’s THE MEG! A submarine crew is left trapped at the bottom of the Pacific Ocean while a 75-foot-long prehistoric Megalodon shark is swimming in the murky waters nearby. But if death by mauling isn’t really your type of murder, SLENDER MAN can haunt your dreams this August. For a great movie more fitting for children, dust off your Winnie the Pooh stuffed animal with Disney’s heartfelt live action adventure of CHRISTOPHER ROBIN, where he rediscovers the joys of life inside the Hundred Acre Woods as an adult. Our winners take home the coolest movie merchandises and just this year, we have given away a Deadpool standee, Grease bomber jacket, $50 AMC Gift cards! So, if you want to stay trendy this summer, join hundreds of winners and enter our sweepstakes. For our first sweepstakes, stay quiet! If they hear you, they hunt you…..down with merchandise prizes in our latest A QUIET PLACE Sweepstakes, one grand prize winner will be taking home a 4K Combo copy of the movie and Prize Kit. 2 secondary winners will also receive a 4k Combo copy. Or if you love prizes that are more family-friendly, get ready for a new adventure in uncharted waters with Drac, Mavis, and the whole gang with our latest sweepstakes! 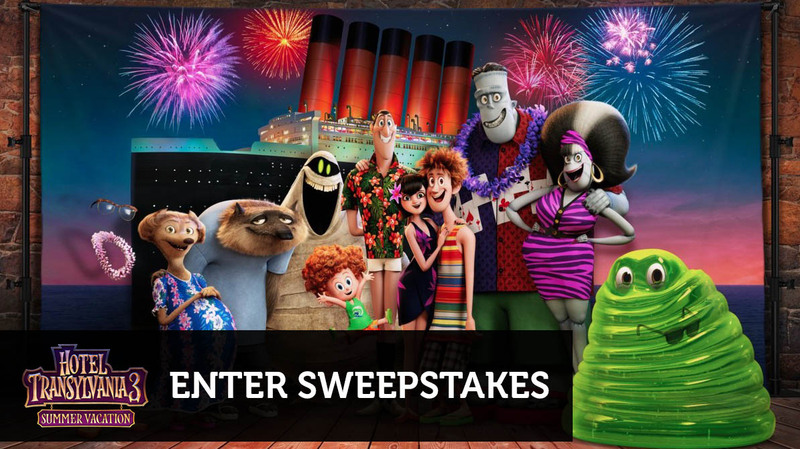 In our HOTEL TRANSYLVANIA 3 Sweepstakes, one lucky winner will win a $50 Regal Gift Card for your family to go watch the movie in theaters!